Carpenter: “Heck, anyone can cut a board and swing a hammer…" Whether it’s removal and replacement of a door or window unit or adding a partition wall or TRIM (yes, now that’s a specialty we are familiar with), we have the knowledge and equipment like compound miter saws, slide saws, air nailers and air and impulse trim nailers. 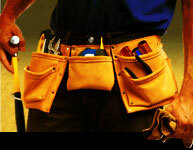 We know how to modify cabinets and countertops for special installations… … …the list goes on. We get you through the woodrot or termite damage that usually devastates a home or a sale of home. Siding: “Heck, anyone can pop on a piece of siding…" We specialize in the repair of the wood siding in lieu of replacement when applicable and replace vinyl and composite siding easily. We know the new codes as far as the nailing procedures, and we always caulk and seal our joints when finished. Fencing: “Heck, anyone can dig a posthole and nail a picket…" Did you know that most fences require a Permit for planning and construction? And this brings true to the ‘Call BEFORE you dig!” One inch (1”) beyond the property lines = encroachment! We specialize in wood fences….straight picket, shadow, lattice, also vinyl fences and custom work! Home Repair / Handyman: “Heck, that means you can do ANYTHING…" This covers a vast array of items that are forgotten In other areas. Smaller repair items usually found in—and around—the home. Tightening, adjusting, removal and replacement, etc. National EPA Lead Paint Renovator and Firm: Common renovation activities like sanding, cutting, and demolition can create hazardous lead dust and chips by disturbing lead-based paint, which can be harmful to adults and children. To protect against this risk, on April 22, 2008, EPA issued a rule requiring the use of lead-safe practices and other actions aimed at preventing lead poisoning. Under the rule, beginning April 22, 2010, contractors performing renovation, repair and painting projects that disturb lead-based paint in homes, child care facilities, and schools built before 1978 must be certified and must follow specific work practices to prevent lead contamination. FL State Certified Mold Remediator: Effective July 1, 2010 468.84 Legislative purpose — The Legislature finds it necessary in the interest of the public safety and welfare, to prevent damage to real and personal property, to avert economic injury to the residents of this state, and to regulate persons and companies that hold themselves out to the public as qualified to perform mold-related services. The department shall certify for licensure any applicant who satisfies the requirements of s. 468.8413, who has passed the licensing examination, and who has documented training in water, mold, and respiratory protection. Painting: "Heck, anyone can swing a brush and a roller…" Painters are experienced in what type of paint they must use; which rollers and brushes to use (believe me…it DOES make a difference); whether Oil Base, Water Base, or Solvent Base…and where it’s ‘allowed’ to be applied. We also understand the new painting products like Mildew Resistant and Elastomeric-type Paints, and Crestview Home Repair applies all types of Ceiling and Wall Textures for professional repair results. We also have the Airless Equipment for Exterior Paint applications as well as interior.